ArtNr. : 1419248990. Kategorie: Flöte. 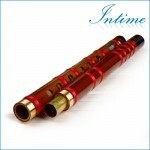 Schlüsselwort: bamboo flute 200g. Material:Merlot bamboo is just one kind of mottled bamboo which has better thick bamboo wood, excellent toughness & high hardness. The production process of Xiao is extremely complex, only the 8-15 years’ mottled bamboo could be chosen to cut from the roots and you can start making after four years of natural drying and baking. ***Under the premise of full respecting for the nature of the natural (Natural features), punching according to the pattern and bamboo joint distribution; tuning according to the hardness, density and tone quality. 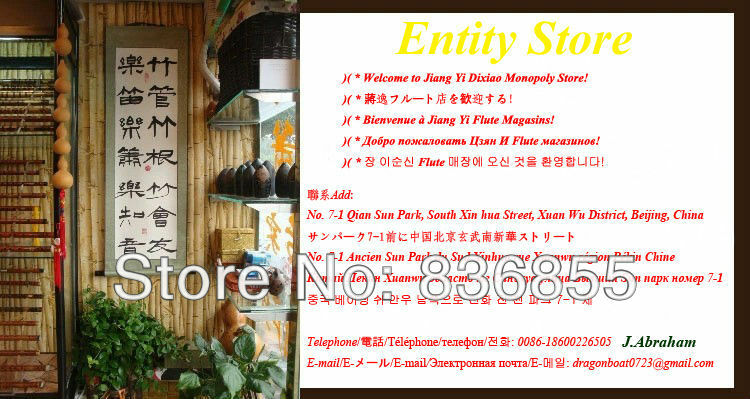 Each xiao were only one itself, different pieces different characteristics, I believe your eyes and ears with your expertise level to choose your best love from the video lesson of my store, and then please give out your distinguished 5-star feedback! Q1: Is it easy to crack? A1: It is easy to crack during the alternating wet & dry environment because of the characteristics of bamboo, therefore, proper use and maintenance can greatly reduce the probability of cracking. A2: Olive oil or Walnut oil is the first choice to be used for wiping the xiao tube, it is can prevent cracking and also let the tone more gentle. And you can use the cotton material to wipe the inner wall of xiao directly when you play it long time. Q3: How to repair if it is cracking? A3: Use a toothpick dampened with AB glue & smears on the cracks, then polish the part of cracks by fine sandpaper till the glue is dry. *Tips:* Please don’t polish the intact part to prevent diacritical (tone quality)! THE XIAO(pinyin:xiao;WADE-GILES:HSIAO)IS A CHINESE VERTICAL END-BLOWN FLUTE.IT IS GENERALLY MADE OF BLACK BAMBOO(CALLED"PURPLE BAMBOO"IN CHINESE).IT IS ALSO SOMETIMES CALLED dongxiao,dong MEANING"HOLE".AN ANCIENT NAME FOR THE xiao IS shudi, LIT. 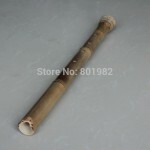 “VERTICAL BAMBOO FLUTE”) BUT THE NAME xiao IN ANCIENT TIMES ALSO INCLUDED THE SIDE-BLOWN BAMBOO FLUTE, DIZI. 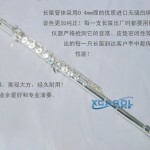 THE xiao IS A VERY ANCIENT CHINESE INSTRUMENT USUALLY THOUGHT TO HAVE DEVELOPED FROM A SIMPLE END-BLOWN FLUTE USED BY THE QIANG PEOPLE OF SOUTHWEST CHINA. THE MODERN SIX-HOLE FORM OF THE INSTRUMENT GOES BACK TO THE MING DYNASTY. ORANOLOGY xiao ARE TODAY MOST OFTEN PITCHED IN THE KEY OF G (WITH THE D ABOVE MIDDLE C BEING THE LOWEST NOTE,WITH ALL FINGERS COVERED),ALTHOUGH xiao IN OTHER LESS COMMON KEYS ARE ALSO AVAILABLE, MOST COMMONLY IN THE KEY OF F. MORE TRADITIONAL xiao HAVE SIX FINGER HOLES, WHILE MOST MODERN ONES HAVE EIGHT;THE ADDITIONAL HOLES DO NOT EXTEND THE INSTRUMENT’S RANGE BUT INSTEAD MAKE IT EASIER TO PLAY NOTES SUCH AS F NATURAL.THERE ARE A FURTHER FOUR(SOMETIME TWO OR SIX)SOUND HOLES SITUATED AT THE TOP END, USUALLY CUT INTO A"U"SHAPE,SOME OF xiao HAVE THE BLOWING END ENTIRELY CUT OFF, SO THE PLYER MUST USE THE SPACE BETWEEN THIRE CHIN AND LIPS TO COVER THE HOLE FULLY. THERE MAY BE A METAL JOINT BETWEEN THE BLOW HOLE AND THE TOP FINGER HOLE FOR TUNING PURPOSES AND SOMETIMES ALSO BETWEEN THE LAST FINGER HOLE AND THE END.THE LENGTH OF THE xiao RANGES FROM AROUND 45CM TO OVER 1.25M BUT IS USUALLY AROUND 75-85CM. USUALLY,SHORTER xiaos ARE MORE DIFFICULT TO PLAY BECAUSE OF THE NEED TO CONTROL ONE’S BREATH(Abdominal breathing) MORE ACCURATELY. THE ANGLE TO PLAY THE xiao IS AROUND 45 DEGREES FROM THE BODY. VARIETIES OF xiaos,THE qin xiao IS A VERSION OF THE xiao,WHICH IS NARROWER AND GENERALLY IN THE KEY OF F WITH EIGHT FINGER HOLES,USED TO ACCOMPANY WITH THE GUQIN.THE NARROWNESS OF THE qin xiao MAKES THE TONE SOFTER,MAKING IT MORE SUITABLE TO PLAY WITH THE QIN WHICH IS A VERY QUIET INSTRUMENT.IT IS ALSO THE LONGEST OF ALL xiao TYPES,UP TO 1.25M. 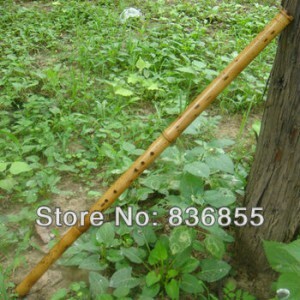 THE nan xiao, “SOUTHERN xiao”, SOMETIMES CALLED CHIBA-"FOOT-EIGHT"(60CM) AN OLD NAME STILL USED FOR THE JAPANESE SHAKUHACHI) IS A SHORT xiao WITH OPEN BLOWING END USED IN THE NANYIN, THE LOCAL FUJIANESE OPERA FROM QUANZHOU. RELATED INSTRUMENTS,A SEPARATE INSTRUMENT,THE pai xiao(pinyin: pai xiao)IS A PANPIPE WHICH WAS USED IN ANCIENT CHINA AND WIHICH,ALTHOUGH IT REMAINS UNUSUAL,HAS RECENTLY HAD SOMETHING OF A COME-BACK.THE JAPANESE SHAKUHACHI AND HOCCHIKU,AND THE KOREAN TUNGSO AND DANSO(ALSO SPELLED TANSO),ARE DESCENDED FROM EARLIER FORMS OF THE CHINESE xiao. 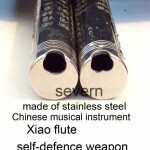 THE ITEM xiao OR dong xiao SPECIALLY IDENTIFIES THE INSTRUMENT AS AN END-BLOWN NOTCHED FLUTE; THE PREFIX MEANS “HOLE” IN CHINESE. YET, TILL THE HAN DYNASTY (206 BC-AD 220),THIS ITEM WAS APPLIED TO PANPIPES (pai xiao) AND THE di REFERRED TO THE SINGLE-PIPED FLUTE. Xiao PLAYERS CAN BE SEEN AMONG THE POTTERY FIGUINES OF THE HAN DYNASTY AND IN THE TOMB BRICK-WALL PAINTINGS OF THE WEI AND JIN PERIOD(220-420) THE MODERN TYPE,OFTEN MADE FROM A NINE-JOINT BLACK BAMBOO, HAS EIGHT FINGER HOLES,SEVEN AT THE FRONT AND ONE AT THE REAR,AND OTHER 2-4 AIR HOLES AT THE LOWER END.THE INSTRUMENT PRODUCE SOFT AND DELICATE TONES, SUITABLE FOR SOLO PERFORMANCE AND DUETS WITH THE qin ZITHER OR USED IN THE sizhu(SILK AND BAMBOO INSTRUMENT)CHAMBER MUSIC TRADITIONS.THE SO-CALLED LONG-FENG xiao REFERS TO THE COUPLED FLUTES RESPECTIVELY ENGRAVED WITH DRAGON AND PHOENIX PATTERNS.